Never before has shrimp tasted so much like chicken. 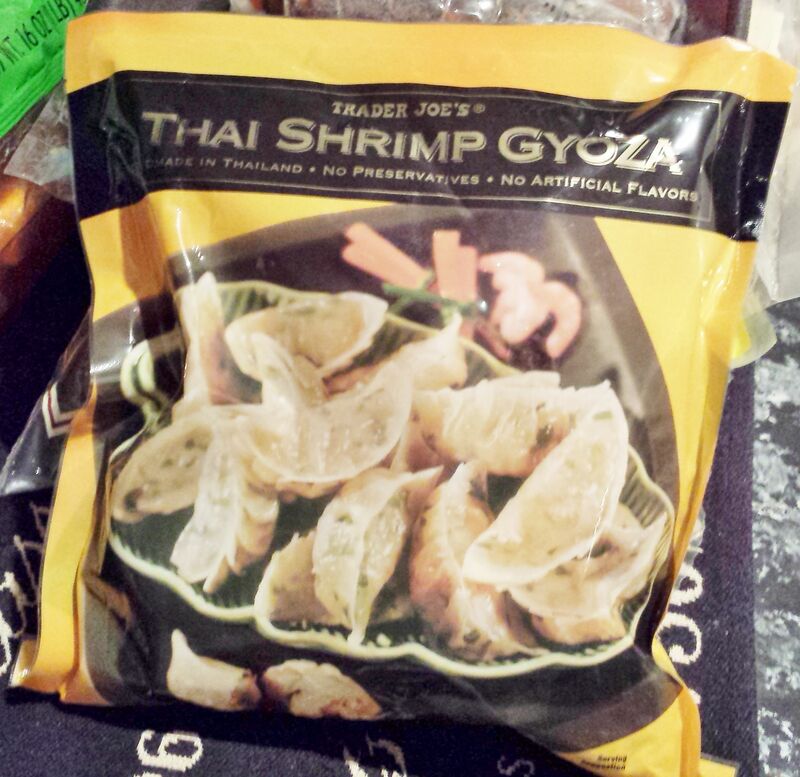 Did you know Trader Joe’s sells Thai Shrimp Gyoza? I sure didn’t, and stood staring at these flat-footed for several moments when I stumbled on them the other day. Everyone knows I think TJ’s gyoza are excellent – and here was an even cooler looking bag with an even more exotic sounding gyoza in it! Guys, you know I had to take a look. Even if someone had been, like, “Don’t do it, man! I’m you from the future – those gyoza are bad news!” I would have been all like, “Psssh – keep your drama to yourself, I’m rocking these gyoza all the way home.” And you know what? I would now be sure that that hypothetical future version of myself was a fraud – because these gyoza are awesome! We talked about what makes a gyoza a gyoza last time, and these Thai shrimp gyoza deliver exactly the same, high-quality, pan-fryable gyoza goodness. The difference, of course, is in the filling. A generous mixture of shrimp, white cabbage, chives and green onion, plus spices, stuffs these tender dumplings of goodness. The result is a gyoza with a little more chewiness to it than the chicken or pork gyoza, but a very similar mildly savory, meaty taste. Shockingly similar in fact. Despite the top-billing of the shrimp, there is almost no discernible shrimp taste to these at gyoza at all. In a blind taste test, I would be hard pressed to tell the difference between the chicken gyoza and these shrimp gyoza. That’s a bit surprising, because while the shrimp has been rather finely chopped it’s still easy to notice the shrimpy texture. This is not the unpleasant lumpiness of the 14 Shrimp Nuggets I gave a shot a while back, but just a sort of pleasant “Oh, that’s a bit of shrimp” experience. If you’re worried these dumplings would be too “shrimpy” for you, that means you don’t have to worry. On the other hand, if you’re looking for a strongly executed bit of shrimp to enhance your seafood dinner, these aren’t going to do the job. That’s a little strange, but doesn’t detract from the overall goodness of the dish. Even weirder than this, is why these gyoza are being made in Thailand in the first place. 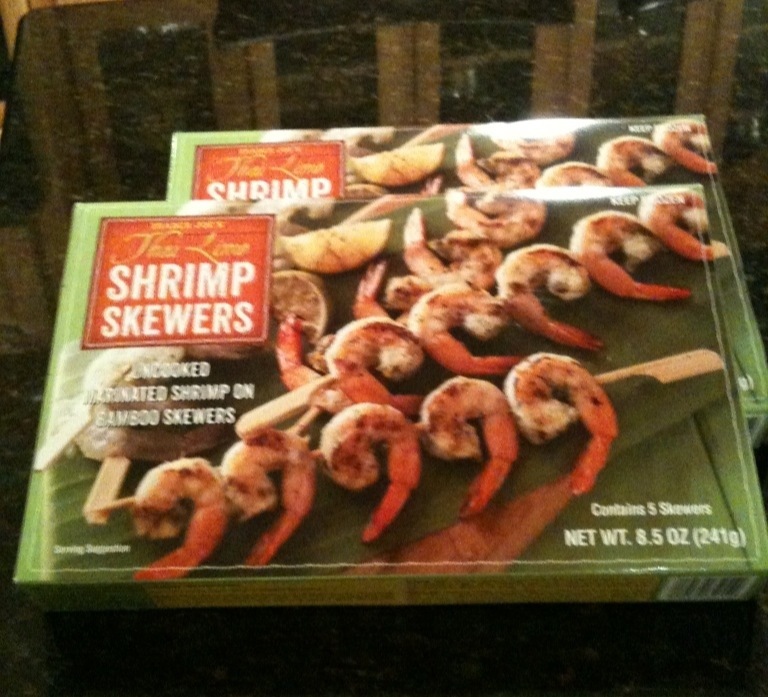 Unlike, say, Trader Joe’s Thai Lime Shrimp Skewers, these shrimp actually are from Thailand. At least, the gyoza are hand made there at any rate, and the shrimp come from off either the Chinese or Thai coast. This is actually a pretty safe thing to say about almost any shrimp you eat, as 75% of the world’s shrimp farming happens between those two countries. That’s all well and good, but it still leaves the window open on why Trader Joe’s calls these gyoza Thai Shrimp Gyoza in the first place. As we talked about before, the cuisine of gyoza is bound up in the histories of China and Japan – Thailand is sort of a non-player in the whole scene. If you’re getting your shrimp from Thailand, I suppose you’re welcome to throw the word in the title, but if you’re just going to make the whole thing taste just like your chicken gyoza I don’t see how that’s really worth the bother. I suppose this, as so many other answers, lays with Trader Joe’s inscrutable marketing department. Presumably there’s a chart someone has on their desk that shows seafood sales increase by 7% when the word “Thai” is in the title. At any rate, all the mind games and marketing ultimately give way to how it actually tastes, and in this case the taste is there. If you’re vegetarian but not pescatarian, or if you’re looking for another totally easy, totally tasty potsticker to stick in your pot there’s no reason not to give these a shot. Would I Recommend It: Sure, these are pretty good gyoza – particularly if you’re staying away from meat. Would I Buy It Again: These gyoza don’t taste all that different from the slightly cheaper chicken and pork gyoza, so probably not. Final Synopsis: A shrimp filled gyoza that tastes just as good as, and just like, Trader Joe’s other gyoza. 14 shrimp nuggets, in all their glory. 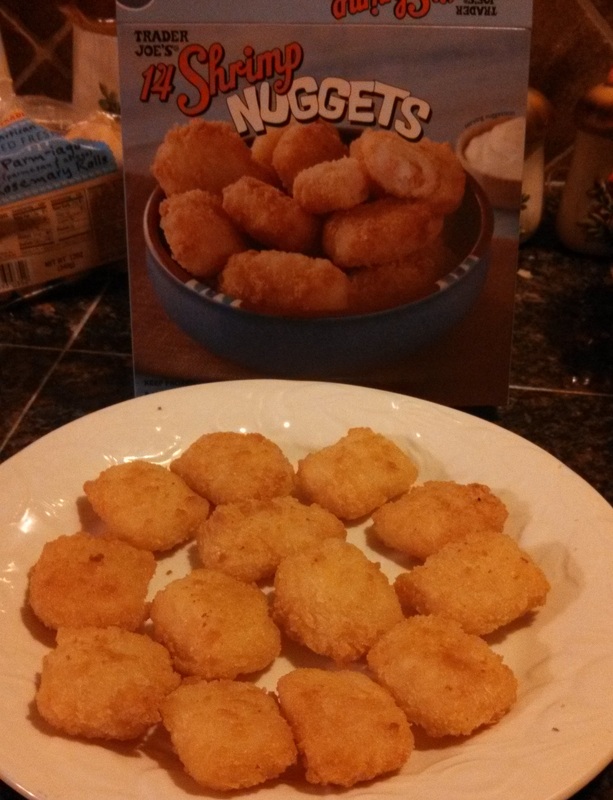 Trader Joe’s 14 Shrimp Nuggets is the kind of product that makes you wonder if they really know what they’re doing of there, or if all the strokes of genius are merely the result of haphazard monkey slaps on the proverbial bank of typewriters. Boy, that gets your mouth watering doesn’t it? Shrimp chunks and shrimp paste? I practically feel spoiled. Also, TJ, I love you but you’ve got to realize that specifying the exact number of shrimp nuggets you’re getting does not make it sound any more appetizing. I get on Trader Joe’s case a lot for products, like their chocolate “nibs”, that are more or less the sweepings of the factory floor repackaged for human consumption. Let’s talk about the positive side first – this is some of the cheapest shrimp around. You can get this 10 oz box of shrimp/shrimp derived product for just $4.99. 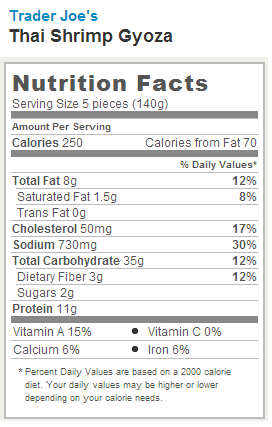 The flip side of that, of course, is that there’s a reason the shrimp in these nuggets is so cheap. There’s only one thing you chop up and extrude into nugget form, and that’s food products that are too small, imperfect or low-quality to market any another way. That’s exactly what Trader Joe’s is doing here – chopping up bits of shrimp that would otherwise be, ironcially, too shrimpy to sell in their normal bags. Honestly, I applaud this sort of activity. There was quite the little uproar when videos of the “pink goop” that McDonalds allegedly makes their chicken nuggets from surfaced on the web. Sure, that’s gross. On the other hand, I think we can all agree that chicken nuggets are pretty tasty. If someone figured out a way to make them from what would otherwise amount to organic waste matter, I think they should be applauded for taking Native American traditions to heart and using every part of the beasts they slay. That brings up back to Trader Joe’s 14 Shrimp Nuggets. If these things were tasty as hell, all would be forgiven and I’d gobble them down by the fistful. The problem is, these shrimp nuggets are not very good. Chunks of shrimp embedded in a gelatinous paste has a weird mouth feel. As far as taste goes, they are pretty much exactly what you would expect – think fish sticks but with shrimp. The trouble is, the only way to bake these up, also like fish sticks, is in the oven. Once you’ve done so, you’ll notice that the nuggets are now sitting in a big puddle of oil. Why? Because of all the palm oil in the bread crumb coating – the same reason these back in a shocking 15 grams of fat per serving. 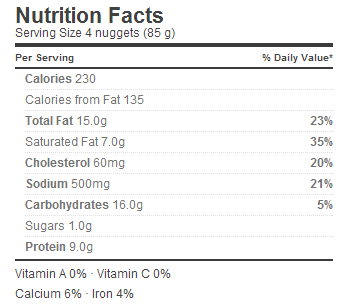 With 3.5 servings per box, that’s 80% of your daily fat intake for the 14 nuggets together. Point number two is, I hope, pretty self explanatory. The shrimp pieces in these nuggets are large, as promised. However, that makes for an irregular eating experience. 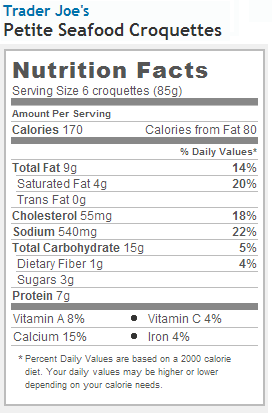 Where a chicken nugget or fish stick is homogenous all the way through, these shrimp nuggets are an aggregate of various sized bits of shrimp that make them various squishy and chewy. If you’re a huge fan of seafood in processed stick or nugget form, these would probably appeal to you, but as far as I can see these shrimp nuggets seem only to exist as an outlet for otherwise unusable shrimp. Would I Recommend It: Not really. Not terrible, but not very good either. Final Synopsis: Lumps of shrimp in oily nuggets. When you put salmon on a salad it’s no longer a salad – it’s merely a bed of “salad greens”. Many a good salad have I reviewed from Trader Joe’s, but always am I on the prowl for more – ever hunting, never satisfied. 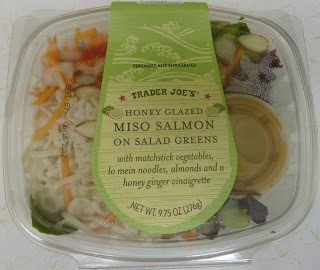 So it was that, in my endless roaming, I cam across Trader Joe’s Honey Glazed Miso Salmon salad – an Asian-style salad with pretensions to greatness, but which settles merely for good. 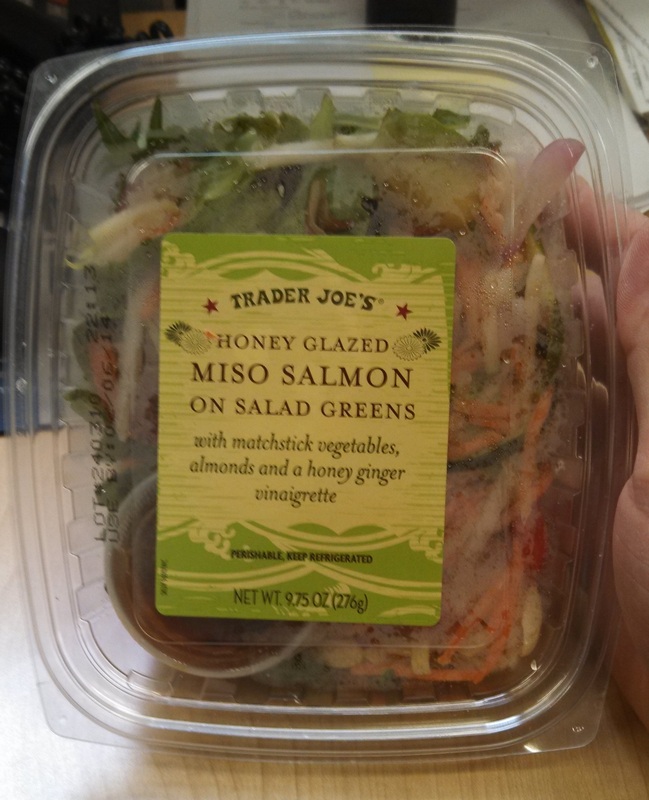 Before we dig into this salad, it’s important to note which version of Trader Joe’s Honey Glazed Miso Salmon on Salad Greens I’m talking about. Running contrary to the feeling of friendliness and openness that Trader Joe’s cultivates is their shadowy, behind the scenes operations. The goings-on of Trader Joe’s corporate offices are famously private – cloaked from all public scrutiny due to orders straight from the owners, Germany’s ultra-private Albrecht family. Despite the rather sinister tone all this evokes, Trader Joe’s seems to be a mostly a force for good – at least in the supermarket world. One way that it continually surprises me, however, is through the continual reformulations that TJ’s is carrying out invisibly, beneath our very noses. Last month I found myself staring rather blankly at my old friend Turkey Bacon, not sure who he was anymore. The packaging was the same, the product copy was the same, but these were undeniably different strips of meat – leaner and with a different, less tasty, flavor profile. Can I prove that this was a reformulation? No, I have no proof, nothing beyond my own vanishingly subjective experiences, and Trader Joe’s won’t comment. Is this how the hegemony convinces us that our protestations are merely symptoms of madness? By replacing our bacon? Time will tell, I’m sure. Rather more noticeably is the face lift that the miso salmon salad in question went through. A previous product of the exact same name but of totally different formulation used to sit on Trader Joe’s shelves. This previous iteration, in addition to having different packaging, was served over lo mein noodles and had an inferior salmon. The version I’m reviewing today has no noodles and a better cut of fish – overall a change for the better. The previous version of the salad – notice the noodles. There’s a lot to love in this salad actually – salmon, first of all, is a wonderful salad accompaniment. Not only is it flavorful and healthy, but it flakes easily under the fork, a highly desirable quality for a fork-only food. That said, salmon can be a difficult fish to do right – doubly so when you’re packing it cold into a refrigerated salad. Trader Joe’s does a reasonable job delivering the salmon here. It’s a generous hunk of fish, and clearly some love went into the cooking process, in particular the miso-honey glaze. The miso honey glaze is nearly as good as it sounds, a sweet and tangy drizzle of flavor that gives your taste buds a pleasant zing. That said, the salmon itself is somewhat on the bland side, possibly over boiled. In any case, it’s the glaze you’ll notice, and the salmon passes by more or less as wallpaper. The rest of the salad delivers a similarly satisfactory experience. “Matchstick” vegetables simply means that everything has been julienned into long veggies strips, strips that include such elegant additions as daikon (a mild Japanese radish) among the carrots and broccoli. The slivered almonds are also a nice touch, giving a bit of toothsome crunch to the proceedings. The biggest problem, for me, was the salad dressing. The honey ginger vinaigrette included with the salad wasn’t bad – but I found it too oily, and tending toward bland where it should have been zingy. Not a death stroke, certainly, but a problem in that it’s hard to find a good dressing to pair with the honey-miso salmon. Apart from this one little misstep, this salad was a welcome change of pace to the chicken dominated salad fare that makes up most of Trader Joe’s other selections. Would I Recommend It: Yes, but bring your own dressing. Would I Buy It Again: Yes, and I might try TJ’s Asian Sesame Seed Dressing with it next time. Final Synopsis: A good, Asian salad with average salmon on it. 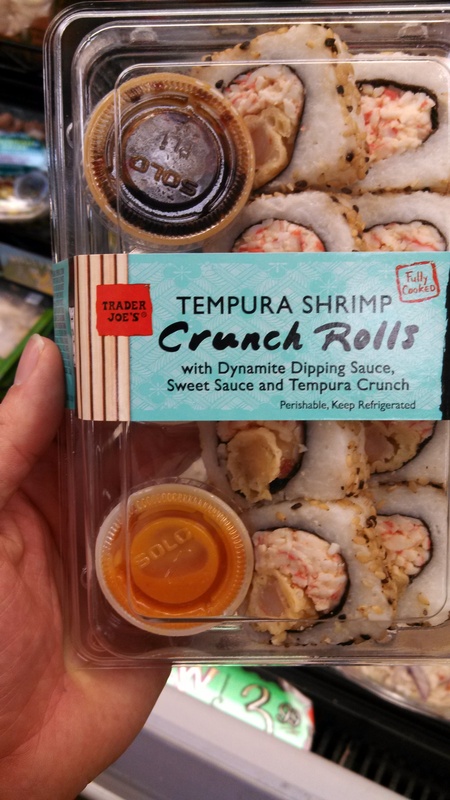 Trader Joe’s Tempura Shrimp Crunch Rolls – well, these are interesting. I fully intended to never buy another clammy lump of Trader Joe’s sushi ever again. This isn’t a Trader Joe’s problem, this is a general supermarket problem. Supermarkets (the places that keep food for weeks on refrigerated shelves) simply do not match well with sushi (the delicate slices of raw fish mean to be eaten as fresh as possible). The problem is I love sushi, and even the most lopsided of supermarket california rolls call out to me with plaintive little voices, begging to be eaten. Like a man in a bad relationship I kept going back for more – and every time I did I was left with a bad taste in my mouth, swearing I’d never do it again. The supermarket sushi experience, though universally bad, never quite broke my eternally hopeful nature that this time, surely, they were going to get it right. The vicious cycle continued until I found myself staring at the mealy, flavorless, half-eaten mass of a Trader Joe’s Quinoa Roll and realized this had gone on too long. I was never going to let sushi treat me that badly ever again. I was done with supermarket sushi, and I meant it. I was doing good – walking past the sushi aisle without so much as a second glace, developing a sense of self-worth – until yesterday when I saw the tarted up, trashy glory of Trader Joe’s Tempura Shrimp Crunch Rolls and my willpower just gave way. Grasping at the flimsy excuse that is this blog (“I have to buy this terrible thing, I owe it to the public!”) I clutched the sushi rolls to my chest and sped home. Why do I do it to myself? Do I crave the abuse? Whatever the case, I found myself there again, off the wagon, staring at a polyurethane tray filled with damp rice wads. Only this time, my friends, this time it’s actual good. How is that possible, you ask? How did Trader Joe’s manage to make bottom rung, low grade sushi worth eating? Quality ingredients? Magic? No – the answer is much simpler. Trader Joe’s simply identified the weakest link in supermarket sushi (the way it tastes) and came up with a brilliant solution – drown it in delicious sauces! It’s honestly surprising that it took a supermarket so long to hit on this elegant solution. “Fusion” sushi restaurants have been doing this for years – smothering their otherwise mediocre fish with cream sauces, spiciness and bread crumbs. Trader Joe’s does the exact same thing. In each package of Tempura Shrimp Crunch Rolls you’ll find three tubs of savory toppings – a tub of “Sweet Sauce” (aka soy sauce thickened with sugar), a tub of “Dynamite Sauce” (aka spicy mayonnaise) and a tub of tempura crisps. The Sweet Sauce and Dynamite Sauce are nowhere near healthy, and Trader Joe’s gives you enough to lay a heavy drizzle on each pre-cooked tempura shrimp roll. How do the tempura shrimp rolls taste by themselves? I have no idea, I never tried. Why bother setting myself up for yet another bad experience when I have thick, delicious sauces to ladle on? I will say that they are relatively crispy and crunchy, and hold together well enough for either a chopstick or fork to take them on a fantastic voyage through the world of sauce and into your mouth without falling apart. When you do get to your mouth, you’ll be surprised at how good tasting these sauces actually are. The Sweet Sauce is akin to a sweeter form of teriyaki sauce, dripping with syrupy goodness, and the Dynamite Sauce is mildly spicy and endlessly creamy. Liberally apply the crunchy, round tempura crisps to the outside of the sauced up sushi for some enjoyable texture and you’re in for an eating experience that’s a powerful taste explosion, if not exactly the paragon of elegant dining. Some of you purists out there might protest that fully-cooked shrimp dripping with tempura crumbles and mayonnaise is not, strictly speaking, real sushi. You are, of course, absolutely right, but you’re also missing the point. Criticizing the authenticity of these products is like getting upset about the representation of physics in Scooby Doo. You’re just setting yourself up for a bad time. Supermarket sushi is, and always has been, little more than junk food. By adding sauces, Trader Joe’s has merely helped complete that apotheosis. Would I Recommend It: Not to anyone who likes actual sushi. Would I Buy It Again: Yes – whenever I want to indulge my trashy side. Final Synopsis: Not exactly sushi, but the sauces sure are delicious. Made with imitation crab – TJ’s makes a clean breast of it right in the title. Trader Joe’s Petite Seafood Croquettes are pretty dang good. Maybe not New England crab shack good, but still good in their own right. Of course, these seafood patties are not to be confused with Trader Joe’s Maryland Style Crab Cakes, Seafood Crab Cakes or, really, anything that might actually contain anything like real crab. These mini seafood croquettes are, of course, made with imitation crab, also known as krab, mock crab, or seafood extender, but most commonly called by it’s official name surimi. No doubt you have encountered the let down that is surimi imitation crab many times in your life when you thought that maybe you were actually eating real shellfish. Those happy moments come to you via far eastern Asia, a land known for it’s love of heavily processed deep sea food products. Surimi first popped into existenece in Japan, 1963, in the chilly Hokkaido food laboratory of one Nishitani Yosuke, the man who first industrialized the process of taking nearly any sort of cheap, white fish and machine processing it until it becomes a semi-gelatinous, bland lump. Surimi is produced for it’s texture first and foremost, then flaovred as needed to resemble the crab/lobster/scallops/whatever is more economically, if not culinarily, desierable. So cost effective was Mr. Yosuke’s discovery that it was immediately taken to heart by food manufacturers the world over. Today 2-3% of the global fish catch is directly processed into surimi. That’s roughly 3 million pounds of fish going under the mechanical pulverizers annually or, to put it another way, about 4 tons of surimi being extruded every day. Most surimi is made from pollock, or our old friends hake. The surimi that we’ll be trying today comes from the threadfin bream, a very boring normal looking fish that you’d forget about as soon as you saw it. Explaining to you what threadfin bream tastes like would be beside the point of this article. Trader Joe’s seafood croquettes has about as much in common with the fish they’re made from as dinosaurs have with the fuel in your gas tank. So with all that out of the way, what can you expect from one of these croquettes? A rather pleasant experience actually. Despite the mishmash of quasi-seafood ingredients going into these seafood cakes, they taste pretty close to the real deal. 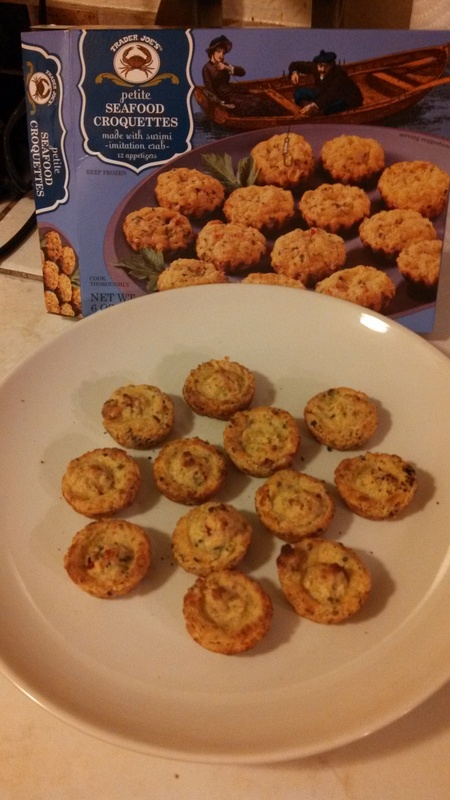 Certainly close enough that you won’t mind paying only $4.99 for the box of them. The mock crab is mixed with egg whites, sour cream, cheese, breadcrumbs and a variety of dehydrated veggies. The result is a very passable entree. A quick trip to the oven will get these guys lightly browned, crispy on the outside, and tender in the center – perfect for crunching lightly between the teeth. They smell just right as well, rich and savory with an aroma very near real crab. This are basically high quality fakes – they won’t impress anyone looking for the real thing, but if you’re in the market for similacra it’s going to be hard to find better than this. My only real complaint is that they are a little off putting visually. As you can see in the above photo, they look less like the hand-formed patties shown on the box and more like they were squeezed out of a tube into row out of row of pre-sized receptacle. It’s the one touch that breaks the illusion that you are eating real seafood. Would I Recommend Them: Yes, to anyone who can’t afford real crab cakes. Would I Buy Them Again: Yes, since that includes me. Final Synopsis: A high-quality crab cake fake. The giant, over-sized cioppino bag. Seafood can be done well, and seafood can strand you in the bathroom for 24 hours – so when someone, even Trader Joe’s, offers to make me a stew from assorted castoff bits of seafood I take pause. Nevertheless, it is my duty to report on such things to you, dear reader, and so I found myself face to face with a bubbling bowl of Trader Joe’s Cioppino Seafood Stew. Cioppino, despite it’s robustly Italian-sounding name, is actually an American creation – springing into existence on the docks of San Francisco in the 1800’s. It owes it’s name to a derivation of the Italian word meaning “to chop”, a naming convention that is less than totally unique. In this case, the chopping was done to whatever the fisherman had left over once the good bits of their day’s catch had been accounted for. This fish, bivalve and crustacean medley was then chucked into a pot and simmered in a tomato and wine base until delicious. This colorful history played through my head as I stared at the floppy, opaque bag Trader Joe’s was peddling – images of unsavory, marine castoffs swimming through my head. As I ripped open the bag and poured its contents into my stew pot, I discovered my fears were for naught. Once again, the TJ’s chefs have saved what may have been a questionable concept in lesser hands by the strength of their delicious recipes. 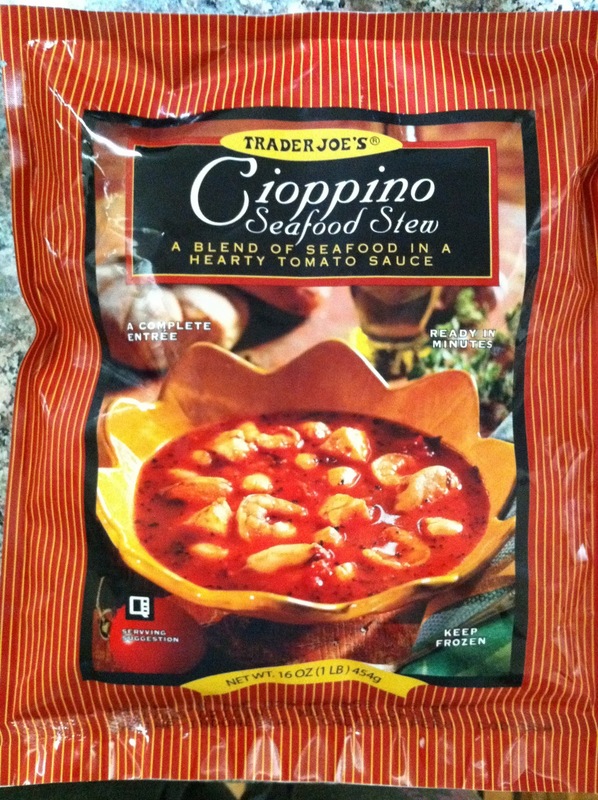 Rich, red and flavorful, Trader Joe’s Cioppino Seafood Stew is as hearty as it is delicious. It’s the base that makes it work – a heavily seasoned tomato stock cut with red wine that verges on the edge of being too salty without going over. It’s a good stew base through and through, a gut-warmer that invites slow, deep sips. The seafood itself is a nice mixture of deboned cod, and shelled shrimp, scallops, mussels and clams. Strictly speaking, this is a departure from traditional ciopinno, which is made from local fish plus shrimp, crab and squid, still bone-in and in shell, as suits the tuff wharf walkers of San Fran. 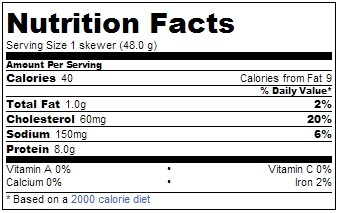 Even better, despite the plentiful helping of seafood in the stew, it doesn’t suffer from a debilitating fishy taste. I didn’t find much to dislike with this stew. 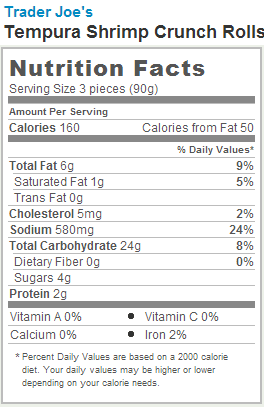 One quibble is that the bag contains 80% of your daily sodium intake between two small servings. Speaking of which, the bag is ridiculously oversized for the contents it holds. Despite the appearances, you’ll be able to cook up the entire dish in a pint-sized sauce pan with room to spare. Trader Joe’s calls this two servings. Not where I come from, TJ. Would I Recommend It: Get your cioppino on, those of you not suffering from high blood pressure! Would I Buy It Again: It’s the perfect excuse for me to buy a bread bowl. Final Synopsis: A tasty, salty seafood stew that does it all right. Disappointingly, the banana tree leaves are not included. Like another syntactically ambiguous citrus product, Trader Joe’s Thai Lime Shrimp Skewers confounds the English tongues ability to parse. Come on TJ, is this a Thai preparation of shrimp with lime, or Thai limes on shrimp? Spurned to action by this irksome lack of clear-sightedness, I threw myself into a burst of quick detective work. 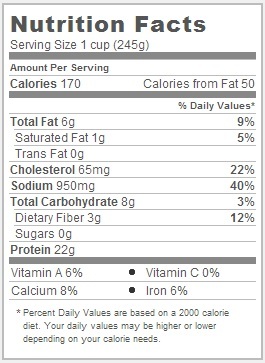 The answer, it turns out, lurks in the ingredients. I present to you, ladies and gentlemen, proudly listed on the second line, the kaffir lime. Yes, the kaffir lime – the very sort commonly used in Thai cuisine! A Thai lime, if you will. Long did I suspect this particular ingredient was one of those overly elaborated upon nouns used for marketing purposes – as in “optic white” or “full serving”. The truth is quite to the contrary. Kaffir limes are not just a distinct species, smaller, uglier and native to southeast Asia, but are also largely inedible. In fact, kaffir limes are used in cooking not for their citric juices, like the garden variety lime, but for the fragrance of their leaves. A grilled shrimp spritzed with citrus is delicious, but this isn’t that. This is a shrimp prepared in a very Thai way, with the aroma of lime but not its zest. Trader Joe’s Thai Lime Shrimp Skewers come uncooked but ready to pop on the oven or grill for your non-bar mitzvah party event. The box holds five skewers of five shrimp, each simply herbed with flakes of the kaffir lime leaf and assorted other spices. The taste is subtle, but distinct – laying on top of the shrimp taste as a counterpoint rather than working with it like a butter or cream. The end result is a simple, and simply prepared, dish that captures the taste of Thai cuisine. The taste is difficult to summarize, after all kaffir lime leaf is not that common here in the West, but if you’ve ever had a Thai curry or Tom Yum Gai you’ve tasted it. Trader Joe’s Thai Lime Shrimp Skewers would make a great addition to the buffet table, as a fun option for a family meal or, if you pluck the shrimp from their skewers, a fantastic addition to your curry or light noodle dish. Two words of warning. First, don’t think “citrus” when you buy this – be ready for an exotic taste of Thailand. Second, each skewer is as long as the box they come come in. If you’re prepping them on the range, make sure you have a big, and preferably square, skillet. I used my largest frying pan, but found I could only fit two skewers across it’s diameter at the same time. A square skillet eliminates such geometric hassles, as would cooking them up on the grill. Would I Recommend It: Yes, to party planners or Asian cuisine dabblers. Would I Buy It Again: Next time I tire of ordinary shrimp. Final Synopsis: An easy, healthy way to get a taste of Thailand.